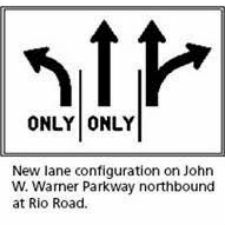 Motorists will notice a new traffic pattern at the intersection of the John W. Warner Parkway and Route 631 (East Rio Road) in Albemarle County. On April 29, the Virginia Department of Transportation modified the pavement markings so the parkway’s northbound right-turn lane will now operate as a shared right-through lane. The improved configuration and corresponding signal timing adjustments, which are ongoing as traffic shifts to use the new pattern, will reduce congestion by doubling the number of vehicles that can travel north through the intersection during each signal cycle. John W. Warner Parkway is a 1.8-mile roadway running from East Rio Road south to the Route 250 Bypass in the city of Charlottesville. The parkway was constructed in two segments, with the county’s portion opened to traffic in early 2012. The city’s portion went into operation in February in conjunction with the ribbon-cutting for the Route 250 Bypass/McIntire Road interchange.